I made this from left-over 1/4 small head of cabbage after making pepper slaw. This a rather healthy salad which definitely can be served in an Izakaya. Here is a close up of the salad. 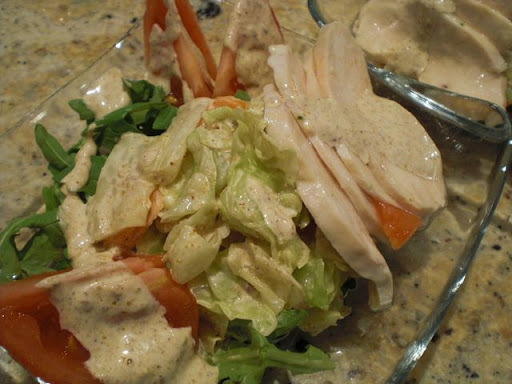 The dressing is rather classic Japanese style; mayo with sesame. 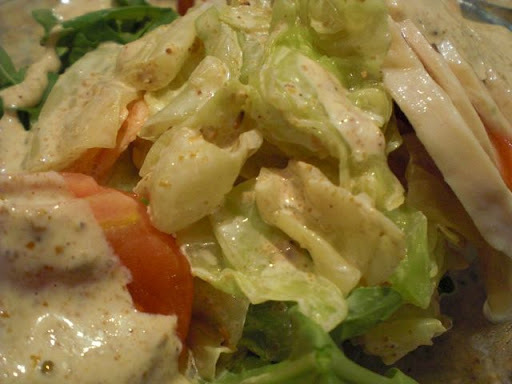 Dressing: I made sesame/mayo dressing. I first roasted white sesame seeds (2 tbs) in a dry frying pan for a few minutes or until fragrant. I tipped it into a Japanese mortar and ground it coarsely (left on the image above). The roasting process really brought out the flavor and fragrance of the sesame. I mixed in mayonnaise (2 tbs) , plain yogurt (2 tbs), and soy sauce (1 tsp). Adding plain yogurt is optional (if you do not use yogurt, increase the amount of mayo). Adding yogurt does not dilute the mayo flavor but it reduces the fat in the dressing. If you were not told, you would not be able to tell that this dressing contains half yogurt. I tossed the boiled cabbage and carrot using a half of the dressing. In the bottom of the glass bowl, I put a small mound of baby arugula and placed the dressed cabbage on the top. I skinned one medium tomato (I placed it in the same boiling water in which the cabbage was cooked for 20 seconds and then put in the ice water) and quartered. I put them on the side. I also had microwave “sakamushi” or sake steamed chicken breast and added a few slices. I then drizzled the remaining dressing over it. We had a bottle of red wine form Ribera Del Duero, Spain, with this dish. We keep finding reasonably priced good wines from this region of Spain. 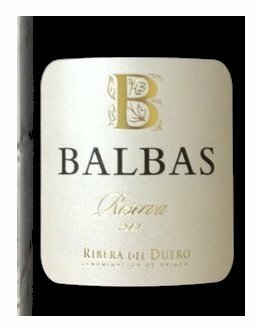 This is called “Ribera del Duero Bodegas Balbas Reserva 2001”. This wine is made of 100% Tempranillo. It has a nice distinctive cedar-y nose. The palate is not too flashy but very nice and black fruit upfront with spices leading to well-integrated smooth tannin. It lingers in your mouth quite sometime. For 2001 vintage, this one has a nice balance of age and youthfulness. This one got 93 from WS and we agree with this score.